They show that the population is declining, the proportion of those who identify themselves as Belarusian is increasing and the role of the Belarusian language is weakening. The period of Lukashenka's rule has coincided with the sharpest decline of population since the collapse of the USSR. The other important development is that the use of the Belarusian language has reduced dramatically, leading to the formation of a Russian-speaking Belarusian nation. It is remarkable that the largest share of Belarusian speakers is among those who identify themselves as Poles. Belarus, along with many other European countries, faces a problem of depopulation. The government seems to be aware of this, as they included statements on demographic security and policy in such important national documents as the Programmes of Social and Economic Development and Concept of National Security. However, the data from the censuses shows that the policies towards tackling demographic problems have been inconsistent and ineffective. The total population decreased by 650,000 in 1989-2009. The main reason is natural ageing, observed in most European countries. Another major reason for depopulation is emigration – economic, and to a lesser extent, political. While in the first decade (which was a stormy transitional period) the population decreased by 100,000, in the second decade, marked by consolidation of the authoritarian regime, the rate of population decline went up – to more than 500,000 between 1999 and 2009. Of course, it would be wrong to assume that only changes in the political regime caused this. Rather, complex factors are involved. The obvious thing, however, is that the population of Belarus is still decreasing, indicating the failure of the demographic policy of Belarusian authorities. The process of urbanisation continued throughout the period. The urban population reached 74 per cent in 2009. Interestingly, the population of regional (voblasc) centres of Eastern Belarus increased only slightly or even decreased (as in Homel), while western cities, Hrodna and Brest, grew considerably (+ 50,000 each). This is probably due to the fact that Eastern Belarus was incorporated into USSR twenty years earlier than its Western part. Hence, here Soviet industrialization, accompanied by urbanisation, was implemented earlier, while Western Belarus retained a considerable rural population. Minsk, the capital, remains the most populated and fastest growing city of Belarus. As the main economic and educational centre, it attracts young people from all over the country. In terms of numbers, Minsk has grown by 230,000 in the last two decades. A fifth of the whole population lives there now. Such over-concentration of resources in the capital along with regional decline poses serious problems, which any government regardless its political regime will have to face in future. Unlike in western countries, in Belarus the decreasing native population is not replaced by an inflow of immigrants. According to official statistics, only 39,000 immigrants came to Belarus in 2005-2009, which is not sufficient to balance the native population decline. Most of the immigrants to Belarus originate from former soviet CIS countries (32,000) – predominantly from Russia, Ukraine, Kazakhstan and Turkmenistan. The share of non-CIS citizens is insignificant and the biggest groups include Chinese, Lithuanians and Latvians. According to official data, in 2005-2009 around 30,000 Belarusians left their homeland, but independent experts often dispute this figure. The official methodology does not include some important categories of migrants, such as labour migrants to Russia. Today this is perhaps the biggest Belarusian migration group, data on which is not officially published. Belarus remains a relatively monoethnic nation state. Notably, the number of people who consider themselves Belarusians increased from 80 per cent to 84 per cent over the last twenty years. Among the national minorities the largest are Russians, Poles, and Ukrainians. Traditionally, the Russian minority resides in the central and northern parts of Belarus and big cities, while the Polish minority makes up a considerable part of the western oblast of Hrodna, and Ukrainians settle more densely in the southern Brest and Homel regions near the Ukrainian border. As the diagram shows, the size of each of minority group (especially Russians) has been decreasing since 1989. This trend apparently shows that minorities assimilate and change their identities along with the development of the Belarusian independent state. On the other hand, this may be a result of growing national consciousness among Belarusians, who identified with the other nation previously. However, this growing national consciousness is not based on language and culture of the dominating ethnic group, as is usually the case with modern nation states. Here, a rather different picture is observed: over the period, the significance of Belarusian language has declined. While in the 1990s, before the Lukashenka regime had set in, national Renaissance policy improved the position of the Belarusian language, stabilisation of the regime brought the decay of the Belarusian language. Speaking this language was associated with opposition to Lukashenka's pro-Russian regime. As a result, its speakers were implicitly or explicitly excluded from politics and public space in general. This is clear from the diagram below. Belarusian Poles are an interesting phenomenon when it comes to the Belarusian language. They are the biggest national group in relation to the total number of a group who speak Belarusian at home. Out of 295,000 Poles, 120,000, or 40 per cent, speak Belarusian at home, while the share of Belarusians speaking Belarusian at home reaches only 26 per cent. The term “Pole” in Belarus has a rather confusing and ambiguous meaning, as many consider Belarusian Poles as Belarusians of Roman Catholic tradition, who historically were under a strong influence of Poland. This group, though referring to the Polish tradition, evidently is a community that strongly preserves the features of Belarusian culture. In Minsk, the number of people who indicated Belarusian as their native language has decreased almost two-fold within the last decade (1999-2000). In general, only a little more than 10 per cent of the urban population of Belarus speaks Belarusian at home, and for the largest cities this number is much smaller. Thus, Belarusian remains a language of the disappearing rural population, and its future in urban centres does not look optimistic. The language policy of Lukashenka led to the formation of a particular type of modern Belarusian identity, with urban Russian-speaking population considering itself an independent community. The release of Belarusian political prisoners Siarhiej Kavalienka and Paval Syramalotau in late September does not mean that everyone should expect a quick release of all other prisoners of conscience. The authorities stepped up pressure on Ales Bialiacki, Zmicier Dashkievich and Mikalaj Statkievich in order to force them into making a symbolic gesture – signing a petition for clemency. According to the latest information received from Zmicier Dashkievich, he was put into a disciplinary cell where he is being held during 6 days already. He started a hunger strike on September 21. Fulfilment by the authorities of the main condition of unfreezing relations with the West – release of the political prisoners – depends on the situation in relations between Belarus and Russia. The authorities hope that reduction in supply of crude oil from Russia will happen only in the last quarter of this year. The prognosis of social and economic development of Belarus in 2013 was drafted proceeding from the understanding that Russia would supply cheap gas and crude oil on advantageous terms. On December 18, a day before the 2010 presidential election, Zmicier Dashkievich was sentenced to two years of imprisonment on the charge of hooliganism and was supposed to be released in December but in August he was sentenced to another year in penal colony for alleged disobedience to the prison administration. On September 28, it became known that Ales Bialiacki was put into a disciplinary cell on the eve of this 50th anniversary. On September 15 Lukashenka met with Putin in Sochi. State mass media informed that they had talked in a most friendly atmosphere during more than five hours. According to Lukashenko, the next meeting with Putin will take place on December 18-19, just after a meeting of the Belarusian and the Russian Prime-Ministers. The meetings will bring “solutions to urgent questions in Belarusian-Russian relations”. That is, one can expect for decisions on terms of oil and gas supplies to Belarus for 2013. The meeting of the Supreme Council of the Union State. Lukashenka has several times claimed that military cooperation is inseparably linked with economic cooperation. Russia must pay for its western shield with cheap energy supplies. 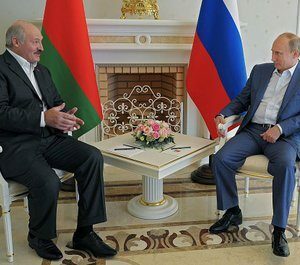 Although Lukashenko did not mention the topic, however it is very much probable that he had discussed the most burning issue with Putin – terms of oil supplies from Russia in the fourth quarter of 2012. On the eve of the meeting there was much information that Russia intended to cut down on oil supplies to Belarus in the fourth quarter – as a penalty for the "solvents business". With all the negative consequences for Belarus: trade deficit, pressure on currency rates, restrictions on social expenditures. Lukashenka was trying to convince his Russian counterpart to meet his needs. He kept repeating that Belarusians are also Russians. Lukashenka left with the feeling that Putin had at last realised that Russia had no other allies. Probably, as a result of the meeting Lukashenko now has grounds to assume that Russia would not cut down on oil supplies. Will Putin Support Lukashenka Once Again? However on September 24 an official document appeared in the media on essential reduction of oil supplies to Belarus in the last quarter of 2012. According to the document, Russia is going to export to Belarus 1.3 – 1.4 million tons of oil less than it had been envisaged by the agreement signed by the parties in December 2011. Putin is not impressed by Lukashenka’s words that the Belarusians are Russians. The Russian president considers that the Belarusian ally can be paid less than he demands for. The Kremlin made a decision to punish Lukashenka for the solvents business, on which Lukashenko had gained, and Russia had lost, a sum of around two billion US dollars. On September 26 Belarus blocked the Russian proposal to the Council of the Eurasian Economic Commission (EEC) that would allow excluding non-taxable export of solvents, lubricants and bio-diesel fuel. According to the procedure, decisions in the EEC are made by consensus. Now it is Russia’s turn to respond. There is a probability that in December 2012 Russian offers on oil supplies in 2013 will not make the Lukashenka team happy. This may prompt the regime to release all political prisoners to build relations with the West.